In this weeks show, Ariel introduced ' Watch What If ', we re-visit Omega (Ariel literally visits them) and the continuation of this years 'Holliday watch guide'. So who did they name? Ball, Bathys, Baume & Mercier, Sinn and Maurice de Mauriac just to name a few. This week, John makes it through the entire show without a single rant while discussing Omega and the start of this years 'Holliday watch guide'. So who did they name? Seiko, Citizen, Luminox, Hamilton, Prometheus, just to name a few. This week John makes it extra ranttastic (for your pleasure) when they discuss the Dream Watch 4 iPhone case, that Hublot is the "Official Watch Maker & Timekeeper Of Ferrari", Ariel's visit to the Blancpain Haute Horology Watch Manufacture and the difficulties of buying a good used watch in China. Who would have thought it would be so hard? This week on HTS we speak about Ariel's visit to Arizona Fine Time and Grand Seiko and how shopping for watches that cost more then your home with a skimask is actually a bad idea. We also do a fly by of the MB&F Legacy Machine No. 1 Watch and look forward to Romain Jerome's take on incorporating DNA of the iconic DeLorean in to a watch. Will going 88MPH with this bad boy on make you travel through time? Probably not ... but trying may let you travel to traffic court. "Why, hello officer ... "
This week on HTS we speak about the Hublot Antikythera Calibre 2033-CH01 Watch, a French movement manufacturer Dubois Dépraz, the Ulysse Nardin Freak Diavolo and finish up with the Alpina Startimer Classic Automatic Chrono - a watch with a lot of potential but with tiny hands and no chrono pushers. On our world tour we speak about the One Watch Auction and give some of the results, extend our hands to the Parmigiani 114, get in touch with our inner Swatch, tour the Gallet The Museum Edition Flight Officer Chronograph and go far east for the Dedegumo Unique Japanese Fashion Watches. NOTE: at no time did not leave the studio during the recording of the podcast -- only metaphorically. Today we have a special treat. Ariel was able to sit down and chat with the head of MB&F Watches, Maximilian Büsser. To interact with us and share your questions, please follow us on Facebook. In this weeks episode we discuss Kickstarter.com, Audemars Piguet Royal Oak Offshore GINZA7 Watch, Swiss Army's 'Original' and Tudor Watches (AKA, the 'baby Rolex). In todays off-beat episode we discuss the Planet Tatooine Collectibles watch from kickstarter.com (insert your own Star Wars quote here), the Ellicott Majisty Watch and the Patek Philippe 5235 Annual Calendar Regulator watch. In todays upbeat episode we discuss the Kello iPhone watch timing 'thing-a-ma-bob' app , the Tag Heuer Link Smart Phone (and John's general detestation of all 'watch phones') as well as Grand Seiko watches. In todays riviting episode we discuss the Romain Jerome Space invader watch, how to spot a fake watch (fake people are easy to spot) and custom watches: not just for the uber-rich anymore. Todays catch of the day includes the Clerc Hydroscaph GMT, a tasty Reactor Poseidon 1000m Dive Watch, a little something from Jaeger-LeCoultre and all the banter you can eat. Today we speak in depth about some watch repair options, Ennebi Watch and the Chrono Swiss double Retrograde . On todays 'hot plate' we discuss Débaufré Swiss Watches, the Movado Bold and Azimuth watches. Today we give some Basel predictions and find what what Ariel expects to see while there. Also, we introduce you to the Double Rain-Beau Fund . This is a fund to help raise money for our audio engenier, so that he may purchase a new computer. His current 2003 model just isn't up to the task of making us sound 'oh so pretty' without some serious coaxing and mild foreplay. Once again, we speak more on the BLJ08 movement. Why? Because it is our show and we can ... and we also think it is cool. This week we talk about, you guessed it, Charlie sheen. Also we manage to sneak in some other stuff. Your boken watches - do you still wear them even if they dont work? LVMH acquired the Bulgari Group making them the largest luxury watch group. Audemars Piguet Royal Oak Concept CS1 Tourbillon GMT watch. Did we mention Charlie Sheen? This week we talk about the MB&F HM3 Rebel, the fastest sailbaot in the world - Audemars Piguet/Zenith Hydroptère, Michael Kobold and the Christophe Claret - 21 Blackjack with Automatic BLJ08 movement. Yep, you are correct, that is not a picture of a watch. Good catch. In this exciting episode we talk about the Urwerk UR-110 Torpedo, Ralph Lauren Sporting Chronograph and the Phosphor Reveal all while making schrewed ovservations about the king of 'Unkillable Fashion'. Disclaimer: Any commeants made or depictions derived, that resemble real persons, living or dead/undead is purely coincidental and are not meant to trigger the zombie apocalypse by enraging their possible leader, Karl Lagerfeld. 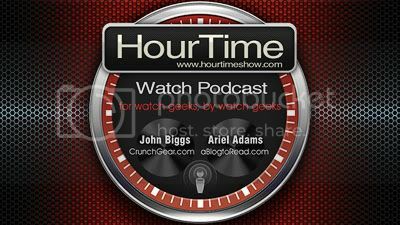 In this podcast we discuss Ressence , Greubel Forsey , Linde Werdelin and Baselworld. Also, Ariel prepares for Baselworld while John works on his remote pacific island death-ray. We have another treat for you and it comes in the form of an interview with Pierre Halimi Lacharlotte from F.P Journe. Pierre answers our questions and shares his insites. Today we have the special privilege of having Jake Ehrlich join us for the show. Jake is well know in the watch industry for his work over at Rolex Magazine.com where he flexes his cerebellum and research prowess as a renowned Rolex historian. We ask the questions and Jake ... answers them. Kind of what you would expect from an interview, I guess. Episode 53 - You wear it around you neck. In this weeks episode we speak a bit about Tag Heuer, what was big at SIHH (The Salon International De La Haute Horlogerie), how being the govern-nator must have cut in to Arnold Schwarzenegger's watch collecting and little more on the Slyde. Also, listen all the way through to learn how John feels about our listener-ship.